Works with All iPhone 4G (OS 5 with BaseBand 04.10.1 ONLY), GUARANTEED! FIRST THERE WAS YELLOW,THEN RED,THEN GREEN NOW FINALLY THE ULTRA AMAZING MOST STABLE AND RELIABLE BLUE GEVEY!! UNLOCKS ALL VERSIONS OF IPHONE 4! LATEST VERSION,MAY ONLY NEED TO DIAL 112 FOR INTERNET, BUT ONLY FIRST TIME. AFTER THAT ITS AUTOMATIC. Unlock iPhone 4 without jailbreak. No need for software unlock. It will NOT void your warranty. 2. power off iphone and insert the gevey sim with micro sim together. 3. view the welcome message .click accept. 4. Call 112 .end off . 5. Turn on the plane mode, just be patient and wait until get the "no sim insert" . 6. Turn off the plane mode, then " invalid sim". 8. Turn on the date roaming and 3G, the network will work. 9. each time user reboot iphone4, only need to click the cancel. the phone will search the signal automatically . 1. After follow Manual if no signal, please power off your iphone and try again. 2. When you wanna use 3G function ,you should open the 3G function in the menu . 3. You can select the welcome language in the STK. 4. To use 3G network you need to turn on “Data Roaming”. 5. 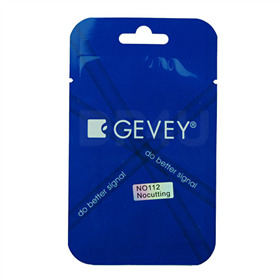 Before you use GEVEY, please make sure your Iphone 4 is active first.